You spent hours on your feet, navigating more than 50 football fields of exhibit space—climbing into cabs, trying new technologies, listening to elevator speeches. You heard some fresh ideas, met some new people and learned a little more about your competitors. But now that you’re back on the job, do you think the experience was worth it? Will your investment in CONEXPO-CON/AGG 2017 pay off? We can’t answer that question for you. 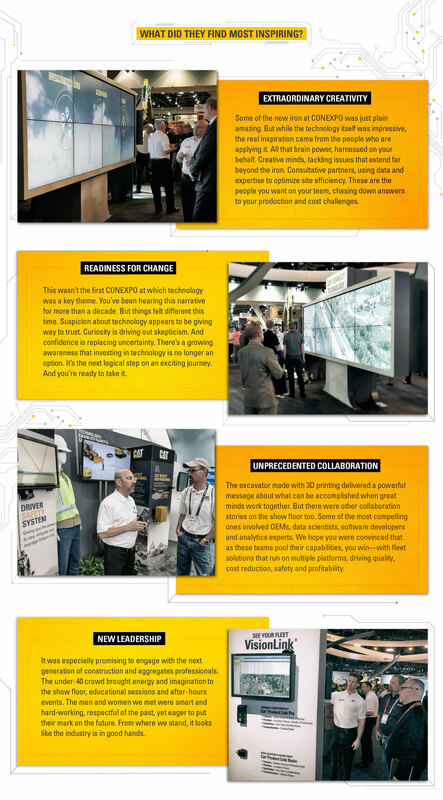 But based on what we’re hearing from people who attended the show, CONEXPO delivered something important—a big dose of inspiration and a new level of confidence about what comes next. So was CONEXPO worth it? You decide. But know that the experience left us more inspired than ever to deliver innovations that make you more successful. Get more information about smart iron and connected jobsites from your Cat® dealer. And if you happened to miss CONEXPO-CON/AGG, check out the video and photo highlights here. What did they find most inspiring? Extraordinary creativity. Some of the new iron at CONEXPO was just plain amazing. But while the technology itself was impressive, the real inspiration came from the people who are applying it. All that brain power, harnessed on your behalf. Creative minds, tackling issues that extend far beyond the iron. Consultative partners, using data and expertise to optimize site efficiency. These are the people you want on your team, chasing down answers to your production and cost challenges. Readiness for change. This wasn’t the first CONEXPO at which technology was a key theme. You’ve been hearing this narrative for more than a decade. But things felt different this time. Suspicion about technology appears to be giving way to trust. Curiosity is driving out skepticism. And confidence is replacing uncertainty. There’s a growing awareness that investing in technology is no longer an option. It’s the next logical step on an exciting journey. And you’re ready to take it. Unprecedented collaboration. The excavator made with 3D printing delivered a powerful message about what can be accomplished when great minds work together. But there were other collaboration stories on the show floor too. Some of the most compelling ones involved OEMs, data scientists, software developers and analytics experts. We hope you were convinced that as these teams pool their capabilities, you win—with fleet solutions that run on multiple platforms, driving quality, cost reduction, safety and profitability. New leadership. It was especially promising to engage with the next generation of construction and aggregates professionals. The under-40 crowd brought energy and imagination to the show floor, educational sessions and after-hours events. The men and women we met were smart and hard-working, respectful of the past, yet eager to put their mark on the future. From where we stand, it looks like the industry is good hands.